OGDEN, Utah – Weber State University junior Jeni Claudio is proud to report that she reads regularly with her five young children, who have made great strides in their educational achievement. That’s quite an accomplishment, considering she was raised by parents who couldn’t read. The Claudio family is just one of 2,000 Weber County families served by Weber State’s College of Education Family Literacy Program, since its inception in 2006. The program provides in-home literacy and parenting support to families, most of whom participate in Head Start. Four family literacy facilitators visit 150 families once every three weeks. They provide strategies and resources to help parents with literacy activities, including daily reading schedules and educational activities. They also provide parenting tips, such as setting goals and routines, improving communication and relationships, and establishing positive discipline practices that avoid yelling or spanking. Claudio said her family dynamics changed significantly following the help and guidance of facilitator Ana Carlin, a 2006 Weber State family studies graduate. In addition to changes in parenting, Claudio began her own educational journey. She visited Weber State’s Community Education Center, where she received the help and encouragement she needed to enroll at the university. Now, as a successful junior studying social work, she said those first days are as funny to look back on as they were terrifying to begin. Carlin met with Claudio for nine months, and although the formal visits ended in 2013, they continue to stay in touch. The major focus of the Weber State University Family Literacy Program is to mentor and educate the parents of Head Start children. The majority of participants, 87 percent, come from lower income backgrounds and 60 percent identify as Latino or other ethnic minority. 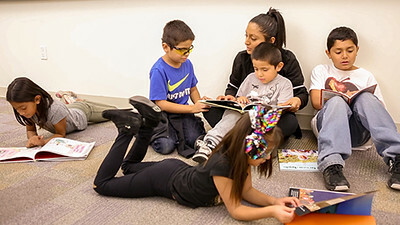 The program operates in partnership with the WSU’s Department of Child and Family Studies, Ogden-Weber Community Action Partnership (Head Start), Elizabeth Stewart Treehouse Museum, George S. and Dolores Doré Eccles Foundation, Ally Bank, Stewart Education Foundation, and the Weber State Packer Center for Family and Community Education. The Glasmann family, represented by Myrene Glasmann Temple, are primary donors. Their father, Jay Glasmann, owned the Standard-Examiner in the 1980s. When he sold the paper, he endowed a fund at WSU for family literacy education in Weber County. Studies show that when families have more books in their home, children are more likely to graduate from high school and pursue higher education. The WSU Family Literacy Program enjoys a partnership with the Ogden Deseret Industries Thrift Store, which donates 4,500 books and educational games for the participating families. In many cases, the donated books are the only reading materials available for younger children in the home. The benefits of early literacy and family-centered learning activities are identified by multiple studies. In 2014, the American Association of Pediatrics recommended reading to children from birth and that doing so is as important as breastfeeding and vaccinations. The first years of life are periods of rapid brain development, and reading enhances vocabulary and communication skills. A recent federal study found that only one-third of children living below the poverty line are exposed to reading and intentional learning activities during infancy and early childhood. For more information about the Family Literacy Program, visit weber.edu/familyliteracy. For photos, visit the following links.